For the second year in a row, we added a QRP station to the Rochester Amateur Radio Club Field Day set-up. “QRP” is an old telegraphy abbreviation that once meant “reduce power” but now has come to mean transmitting with very low power, ... 5 watts or less. The rules give a huge boost to the score as compensation for using low power: the contact points get multiplied by 5. With this adjustment, the best QRP teams are competitive with high-power stations. Since the power limit applies to all transmitters in the entry, this QRP station had to be (formally, at least) a separate entry from the main club, which ran four kilowatt stations in a class 5A entry. 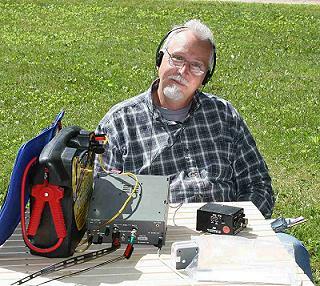 The QRP station was in class 1A-Battery/solar, using the Schaeffer Academy club call W0SAA. With the main group using W0SA, this was just too cute to pass up. The plan was to put up a small tent, a tarp, and an operating table near the road, a ways away from the other antennas. We planned for two wire antennas in the trees (a 170 foot EDZ dipole for 80 and 40, and an 88 foot EDZ for 20 on up), and have both CW and SSB available, an audio splitter for extra earphones and an external speaker, and a laptop set up for either digital modes or observing CW. Logging was on paper. An outstanding feature of this year's operation was how many things went wrong. I had problems getting the wires up into the trees; two batteries failed; my multimeter got wonky; the extension cord for the solar panel didn't conduct; my external speaker didn't speak; and my paddles started sticking, which meant I had to rely on the K2's memories and abandon my plans to try running. And, the weather didn't cooperate for all of Saturday. The wind blew too hard to put up the tarp, it rained more-or-less all day, and it got cold. Just like real camping. I ended up moving back and forth from the table in front of the tent, to operating lying down in my tent, and never got around to setting up the laptop. With the intermittent rain, only a few people wandered over, and we talked about kits and antenna modeling, and mentored beginners to CW contesting. Interference from the kilowatts was always a factor, but only a hindrance, never a crippling issue. Contacts were slow but steady, with a lot of walking around, eating and talking. About 11pm, a bunch went home to comfortable beds. I figured nobody else would be coming over, so I pulled the rig into the tent and slept for a few hours. I woke up about 4:30, lying in my sleeping bag all warm and cozy, reached over and turned on the rig, and started in again. Nice. A few hours after sunrise, I went over to the barn for breakfast. When I got back, 15 had opened up to the east, and then 10 opened up some, too. About the antennas: the long dipole, fed with window line, worked well on all frequencies, even 10. The 88 foot dipole was an experiment: I had read that teflon-insulated twisted pair is as low-loss as window line, and it's much lighter. It turned out to be hard to handle, and the long dipole had better reception on every frequency, every direction. I haven't given up on the twisted pair feeder line yet, but I'm not impressed so far. Over at the kilowatt stations, there were equipment problems galore, too. Interference between the stations was greater than anticipated; one of the primary antennas didn't work (high SWR), and one of the amps failed. Even with all this it was at least pretty good. The digital station had more success than past years, and the VHF station hit a great opening to the east on 6, so some people, at least, were quite pleased. The general verdict, though, seemed to be that 5A was overkill. The QRP station did better than last year: 136 QSOs, all CW S&P, plus 950 bonus points for a claimed score of 2310 points. There was always some frequency we could work, and we got contacts from most of the country -- not everywhere, though, such as Puerto Rico, who couldn't hear me though I could hear them fine. That's part of the fun. Adding a QRP station to a big club high-power setup, as a separate entry, may not make sense for everyone, but it adds variety, while keeping everyone together. It demonstrates an alternative approach, and shows that low power can rack up a significant score. Next year I've got to try running, though.